Dana McLeese (born September 6, 1965) better known by his stage name Dana Dane, is an American rapper known for performance of humorous lyrics and for his fashion sense. 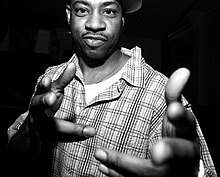 Dana Dane's career began as part of the Kangol Crew with fellow rapper Slick Rick, to whom he sounded markedly similar, although Slick Rick's English lilt was actually genuine. After graduating from high school, he signed with Profile record label in 1985. Dana Dane's debut album, Dana Dane with Fame, peaked at #46 on the Billboard album chart and was certified gold. His debut single was "Nightmare". His biggest hit in the United States was "Cinderfella Dana Dane", which peaked at #11 on Billboard magazine's R&B charts in 1987. Cheryl Green from Queens, NY sang backup. He was among Profile Records’s core artists, then recorded briefly for Rap-A-Lot Records but did not release anything on that label. He released his last album in 1995 on Maverick Records. He is an on-air host for Sirius/XM Satellite Radio on its classic hip-hop channel BackSpin. In 2009, he released his first novel, Numbers (One World/Ballantine/Random House ISBN 978-0-345-50605-4). ^ a b "Birth information for Dana McCleese". FamilySearch.org. Retrieved June 16, 2017. This page was last edited on 19 February 2019, at 21:19 (UTC).